Double-Blind Review is a method applied for publishing scientific publications with the highest quality. This method forms the basis of an objective evaluation of scientific studies and is preferred by many scientific journals. 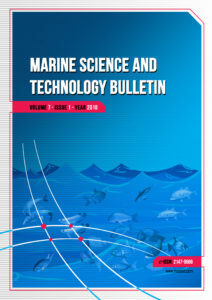 The views of referees have a decisive place in the publication quality of Marine Science and Technology Bulletin. Marine Science and Technology Bulletin uses the double-blind review method, which means that both the reviewer and author identities are concealed from the reviewers, and vice versa, throughout the review process, in the evaluation process of all studies. For this reason, the authors are asked to erase their names while uploading the articles to the system. All the studies sent to Marine Science and Technology Bulletin are evaluated by double-blind review method according to the following steps. The studies submitted to Marine Science and Technology Bulletin are first evaluated by the editor. At this stage, studies that are not in line with the aim and scope of the journal, are weak in terms of language and narrative rules in English contain scientifically critical mistakes, are not original worthy and cannot meet publication policies are rejected. Authors of rejected studies will be notified within one month at the latest from the date of submission. Eligible studies are sent to the field editor to which the study is relevant for pre-evaluation. In the pre-evaluation process, the field editors examine the studies, introduction and literature, methods, findings, results, evaluation and discussion sections in detail in terms of journal publication policies, scope and authenticity of study. Study which is not suitable as a result of this examination is returned to the author with the field editor’s evaluation report within four weeks at the latest. The studies which are suitable for the journal are passed to the referee process. The studies are sent to the referees according to their content and the expertise of the referees. The field editor examining the study may propose at least two referees from the pool of Marine Science and Technology Bulletin Advisory Board or referee pool according to their field of expertise or may propose a new referee appropriate to the field of study. The editors evaluate the referee’s suggestions coming from the field editor and the studies are submitted to the referees. Referees are obliged to guarantee that they will not share any process or document about the study they are evaluating. The period given to the referee for the evaluation process is 15 days. Proposals for corrections from referees or editors must be completed by the authors within 1 month according to the “correction instruction”. Referees can decide on the suitability of the study by reviewing the corrections and may also request multiple corrections if necessary. Referee evaluations are based in general on the originality of the studies, the method used, the conformity with the ethical rules, the consistent presentation of the findings and results, and the examination of the literature. Introduction and Literature:The evaluation report contains the presentation and purpose of the problem addressed in the study, the importance of the topic, the scope of the relevant literature, the timeliness and the originality of the study. Methodology:The evaluation report includes information on the suitability of the method used, the choice and characteristics of the research group, validity and reliability, as well as on the data collection and analysis process. Findings:The evaluation report includes opinions on the presentation of the findings obtained in the frame of the method, the correctness of the analysis methods, the aims of the research and the consistency of the findings, the presentation of the required tables, figures and images and the conceptual evaluation of the tests used. Evaluation and discussion:The evaluation report includes the opinion on the subject based on findings, relevance to research questions and hypotheses, generalizability and applicability. Conclusion and suggestions:The evaluation report contains the opinion on the contributions to the literature, future studies and recommendations for the applications in the area. Style and narration:The evaluation report includes compatibility of the headline with the content, appropriate use of English in the study, refers and references in accordance with the language of the study and APA rules. Overall evaluation:The evaluation report contains opinion on the authenticity of the study as a whole, its contribution to the educational literature and the applications in the area. In agreement with publishing policies of Marine Science and Technology Bulletin, plagiarism check is required for each study that has undergone the “Review Process”. The Turnitin plagiarism checker software is used for plagiarism detection. Proof documents will be sent to the corresponding authors via online submission system. Proofs should be checked immediately and responses should be returned back within 15 working days. It is the responsibility of the authors to check carefully the proofs. No changes will be allowed at this stage.